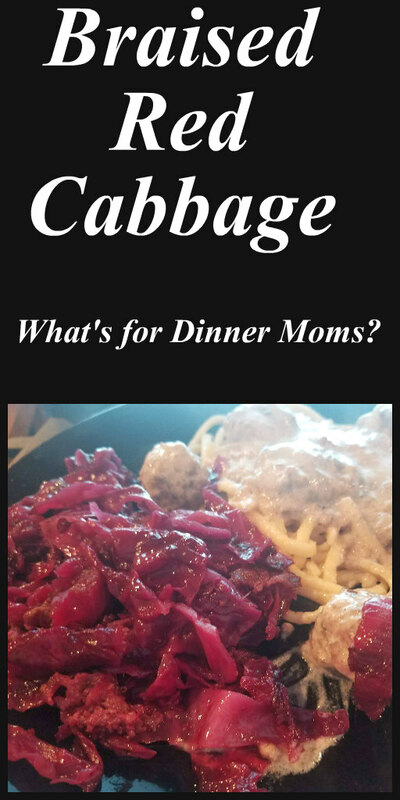 Braised Red Cabbage (updated) – What's for Dinner Moms? 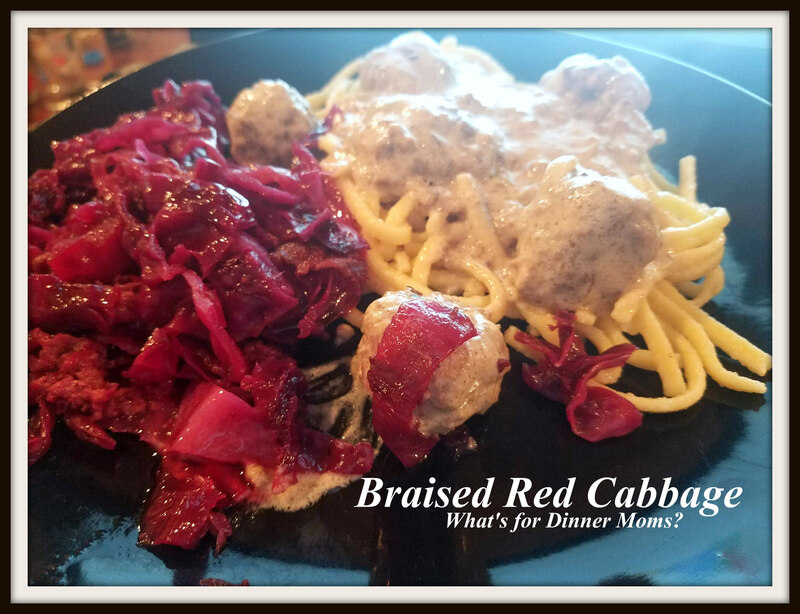 If you asked my children the star of this plate was the Braised Red Cabbage (click here for link to original recipe), although the German Meatballs and Spaetzle were good too (click here for link to recipe). There was not a bite left at the end of dinner. They love red cabbage. My house smelled amazing! My daughter ate most of this and asked for it again soon. This is one of those dishes that I don’t make nearly as often as I should. My family loves this dish and it really isn’t hard to make if I use my mandoline to cut the cabbage. It makes nice thin slices of the red cabbage quickly or even my food processor would make it go quicker too. But the sweet savory taste of the cabbage is worth the tiny bit of effort to make this dish! I have a feeling I know what my daughter is asking to have for her birthday dinner – an entire pot of the Braised Red Cabbage just for her! A sweet tart side dish that goes with pork, beef, and chicken! Cook bacon in a large pot over medium heat, stirring occasionally, until fat renders and bacon is crisp, about 8 minutes. Add onion, and cook, stirring occasionally, until translucent, about 3 minutes. Add cabbage, vinegar, wine, water, sugar, and 1 1/2 teaspoons salt; stir to combine. Raise heat to medium-high, cover, and cook 5 minutes. Reduce heat to medium-low, and continue to cook, covered, stirring occasionally, 50 minutes. Season with pepper. Taste and adjust spices as necessary adding more vinegar if you like.